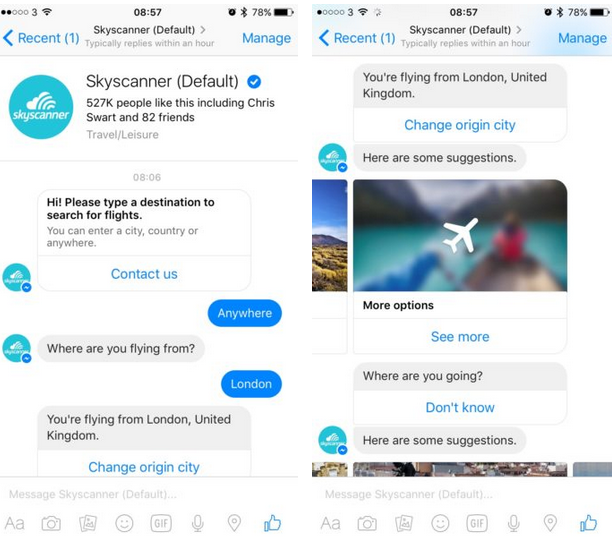 Skyscanner is one of many tech companies to seize the opportunity to reinvent the way they communicate with customers by using bot technology. However, they are not the first ones to introduce this technology into the travel industry. Earlier this year Facebook and KLM airlines announced a partnership enabling KLM customers to receive flight confirmations, boarding cards, reminders, flight status updates, and customer service directly through the Facebook Messenger app. Ready for that summer vacation? Why not give the clever bot a go and find your next travel inspiration. All you have to do is go to Skyscanner's Facebook page and start a private conversation. You can then inquire the clever bot for a flight destination or just hit the 'Contact us' button to speak to a human. Available to any Messenger user typing in English, travelers are able to chat with the bot like they would normally do with their friends. If you are not sure where you would like to go, you can just type “not sure” to find the cheapest destinations from your nearest airport. This neat feature is already known from Skyscanner’s mobile and web apps. The platform is created based on the company’s regular flight data API and the flight suggestions are based on real-time search trends and the current cheapest pricing. The bot then sends a link to Skyscanner’s site so that the user can confirm the flight reservation and make payment. We can see why Facebook Messenger has been chosen for platform given its huge growth potential and more than 900 million monthly active users. Facebook has made developing these clever bots a high priority for developers - some people are even saying that conversational search is the biggest tech innovation since the introduction of the Apple App store. Although a bit exaggerated, we agree that messaging bots have taken the travel industry to a whole new level of user experience.